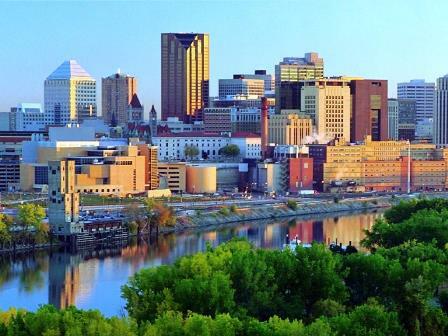 Linda Burton posting from Saint Paul, Minnesota –Every city has both scoundrels and saints in its past, and Saint Paul is no exception. 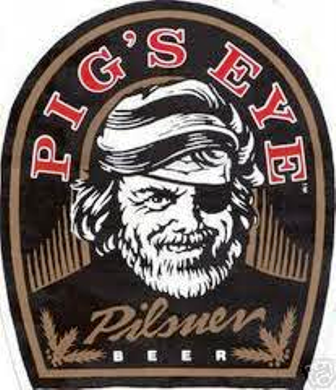 It may have a “saintly” name today, but it started out as Pig’s Eye. Sit back and listen to this tale of two men, and the legacy they left behind. The first character I introduce is Pierre Parrant, a French Canadian born near Sault Ste Marie, Michigan around 1777; he made his living as a fur trapper. 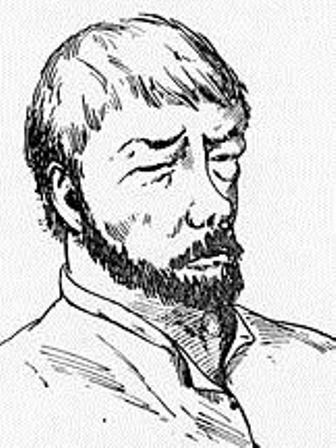 He acquired the name “Pig’s Eye” when he became blind in one eye; he began to have troubles with the law when he started bootlegging. Pig’s Eye Parrant claims two distinctions – he was the first person of European descent to live in what became Saint Paul; and he operated the first business there. The second character I want you to meet is Lucien Galtier. He was born around 1811 in Saint Affrique, in the south of France. 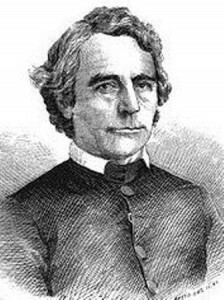 He became a Roman Catholic priest, and was sent to the United States as a missionary at the time people were settling near Fort Snelling in Minnesota territory; he arrived at his new post in April 1840. The distinctions he claims are several – he was the first missionary in the area, he built the first churches in what are now the cities of Minneapolis and Saint Paul, and he is responsible for the name of the city of Saint Paul. The church he began in Saint Paul now occupies its fourth building in the city; sitting atop Cathedral Hill and overlooking downtown, it is the third largest church in the United States and a National Shrine. The city of Saint Paul, beginning with the contributions of two men who tackled the wilderness in strikingly different ways, became capital of the state of Minnesota. We don’t know how Pig’s Eye Parrant lost sight in his eye; maybe a barroom brawl; we do know he arrived in Minnesota territory and began living in a squatter’s colony near Fort Snelling in 1832; the fur-trade business had declined and he sought new ways to make a living. He began distilling his own liquor, which he sold to the squatters, the natives of the area, and the soldiers at Fort Snelling. When the squatters were forced off the land around the Fort, Parrant laid claim to a tract of land at the entrance to a cave on the west bank of the Mississippi River, just upstream from what is now downtown Saint Paul. 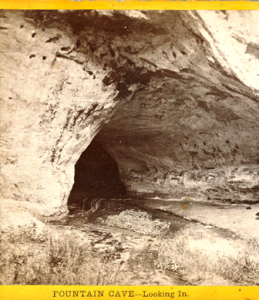 It was June 1838 when he completed building his small shack that became “the first habitation, and the first business house of Saint Paul.” Yes, Pig’s Eye Parrant operated the first saloon in the area; the cave, known as Fountain Cave, provided a steady supply of spring water for his still and his tavern was wildly successful. It was easily accessible by locals, riverboat crews, and of course, the soldiers at nearby Fort Snelling. Pig’s Eye Tavern was so well known that when nearby resident Joseph R Brown sent a letter to a friend in 1839, he listed the return address simply as “Pig’s Eye.” Brown received correspondence back addressed to “Pig’s Eye” and the name stuck; the community around the tavern became known as such. In 1844 Parrant lost his claim at Fountain Cave; some say due to a border dispute with a neighbor; others say due to mounting debts. He left the area and the remainder of his life is left to the imagination. Historian J Fletcher Williams had this to say about Parrant, and what he considered to be his less-than-shining reputation: Such was the man on whom Fortune…thrust the honor of being the founder of our good city! Our pride almost revolts at the chronicling of such a humiliation…but history is inexorable, and we must record facts as they are. Part of the folklore about the city’s name is that Lucien Galtier was “aghast” that the little village on the river derived its name from a man of such ill repute and said, when he built his small chapel in 1841, “Pig’s Eye, converted thou shalt be, like Saul, arise, and be, henceforth, Saint Paul!” Galtier’s own written account of his time in the area does not mention that; he writes: In the month of October 1841, I had…place logs cut and prepared and soon a poor log church that would remind one of the stable of Bethlehem was built. 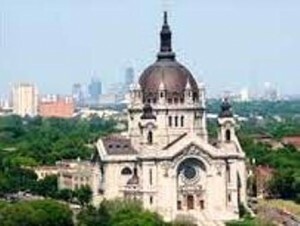 The nucleus of St Paul was formed on Nov 1st, 1841. I blessed the new Basilica smaller indeed than the Basilica of St Paul in Rome, but as well adapted as the latter for prayer and love to arise therein from pious hearts. The church was thus dedicated to St Paul and I expressed a wish that the settlement should be known by no other name. I succeeded….The name St Paul applied to a town or city seemed appropriate. The monosyllable is short, sounds well, and is understood by all denominations of Christians. The boat landed at the foot of Fort Snelling…The sight of the Fort, commanding from the elevated promontory the two rivers the Mississippi and the St Peter (Minnesota), pleased me, but the discovery which I soon made that there were only a few houses on the St Peter side and but two on the side of the Fort, surrounded by a complete wilderness and without any signs of fields under tillage, gave me to understand that my mission and life must henceforth be a career of privation, hard trials, and suffering, and required of me patience, labor, and resignation. I had before me a large territory under my charge, but few souls to watch over. I obtained a separate room for my own use and made of it a kitchen, a parlor, and a chapel. Out of some boards I formed a little altar which was opened out in time of service and during the balance of the day folded up and concealed by drapery. In that precarious and somewhat difficult condition I continued for over a year. On the Fort Snelling side I had under my care besides some soldiers, six families: Resche, Papin, Quinn, Campbell, Bruce, and Resicko; and on the St Peter side, besides some unmarried men in the employ of the company, five families: Faribault, Martin, Lord and two Turpins. No event worth noticing occurred except some threatening alarms given by the Chippewas to the Dakotas. During that year too, in the month of August, I returned sick from a visit I had made to a few families settled in the vicinity of Lake St Croix. Prostrated by bilious fever and ague at the military hospital for nearly two months. The families which I have mentioned as being on the Fort side at the time of my arrival there had afterwards to leave; only two remained. I could not do much good by continuing to reside there; On the 25th of May 1844 I was leaving to better hands the yet barren field of my first mission, not without feeling deep regret – not without leaving friends behind me. 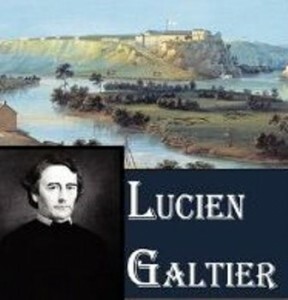 After a stay in France, Galtier returned to the Midwest; he joined the Diocese of Milwaukee in 1847 and served at St. Gabriel’s Parish in Prairie du Chien, Wisconsin, where he remained until his death in 1866. His white marble tomb is in front of St. Gabriel’s church. That first log cabin church he left behind measured 25 x 18 feet; it was later enlarged and in 1851 with the establishment of the Diocese of Saint Paul, was designated a cathedral. Saint Paul needed a bigger church by then; the second building had three stories; a library, kitchen, and school facilities on the first floor, the church on the second floor, and offices and living quarters for Bishop Cretin on the third. Construction of the third building started in 1854 and was completed in 1858; it was built of stone and measured 175 x 100 feet; ornamentation was left off in order to cut costs. Bishop John Ireland instigated the building of the current cathedral in 1904; construction began in 1906. The budget was $1 million; the cathedral design was based on the designs of French churches, with French Renaissance and Classical themes. 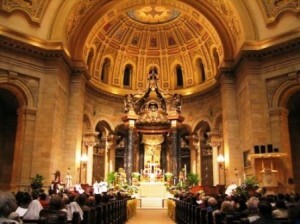 Its open design allows unobstructed views of the altar and pulpit; the dome is 76 feet in diameter and 186 feet high. The Cathedral has twenty-four stained-glass windows and six chapels dedicated to the patron saints of the European ethnic groups that settled in the city – Italians, French Canadians, Irish, Germans, Slavs, and the missionaries. As to the small community Parrant and Galtier left behind; Saint Paul is the capital and second most populous city in the state of Minnesota today; from the few families Galtier named in 1840 to a population of 285,068 by 2010. That first Pig’s Eye business in a small shack by a river cave is still a story that likes to be told, as residents enjoy life in a city of shiny high-rises sitting on the river bluffs, and think back to its beginnings. And by the way, Pig’s Eye Beer is brewed today in Saint Paul; the Pig’s Eye Brewing Company was established in 2002 and produces Pilsner, Lean Light, and Ice; they’ve won awards at beer festivals around the country.